BAM to replace Rosmah Mansor? THE Badminton Association of Malaysia (BAM) could replace its patron Datin Seri Rosmah Mansor to appease sponsors. Insiders reveal a “fresh face is preferred” following allegations of corruption against Rosmah’s husband Datuk Seri Najib Razak in the SRC International Sdn Bhd and 1Malaysia Development Bhd (1MDB) scandals and recent seizures at the former prime minister’s residences. Rosmah was yesterday quizzed by anti-graft officials at the Malaysian Anti-Corruption Commission headquarters in Putrajaya over the probe into SRC International. “There are attempts to find a new patron for BAM … perhaps Tun Dr Siti Hasmah or (Deputy Prime Minister) Datuk Seri Dr Wan Azizah Wan Ismail,” said an insider. Dr Siti Hasmah, wife of Prime Minister Tun Dr Mahathir Mohamad, served as BAM patron for over two decades before she was replaced by Rosmah in 2007. 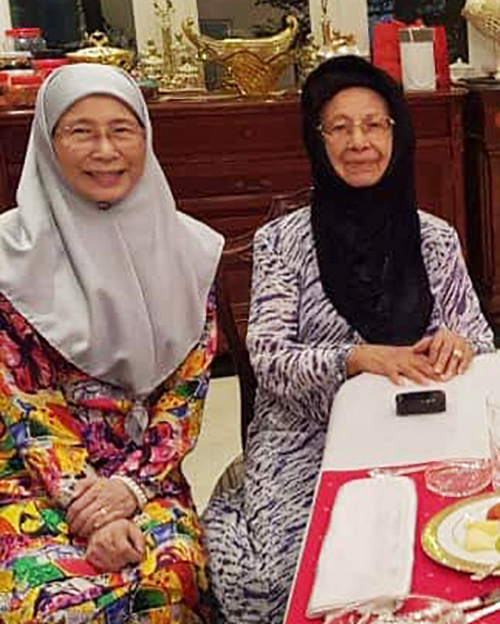 Dr Wan Azizah (left) and Dr Siti Hasmah after a buka puasa dinner last night. It was then said that Siti Hasmah “withdrew” and Rosmah, who actively plays badminton, was “invited” to the national body. Siti Hasmah, however, continued supporting the shuttlers through her occasional visits during training. Siti Hasmah was earlier this year dropped as patron of the Wheelchair Association Malaysia – a position she had held for 20 years – at the height of Dr Mahathir’s scathing attack against Najib’s administration. The association, however, denied the move was political and said it wanted a new patron as part of its “aggressive and extensive” overhaul plans.